Hello and welcome to the 497th installment of the SWD. “As part of a series of specific operations carried out by the Operations Room of the Wrath of Olive against Turkey’s gangs after monitoring and tracking one of al-Sultan Murad’s mercenaries in Azaz area, our fighters ambushed him on July 24, 2018, as he was riding his motorcycle on the road of Harjel village killing him and capturing his Kalashnikov weapon. The killing of the mercenary was filmed by our troops. Islamic State’s Amaq Agency stated that an improvised explosive device destroyed a Syrian Democratic Forces’ vehicle, killing five elements in the village of Al-Artuwaziyah. Improvised explosive device killed two elements of Hayat Tahrir al-Sham and wounded three civilians near Al-Dulab junction in the vicinity of the city of Sarmin. 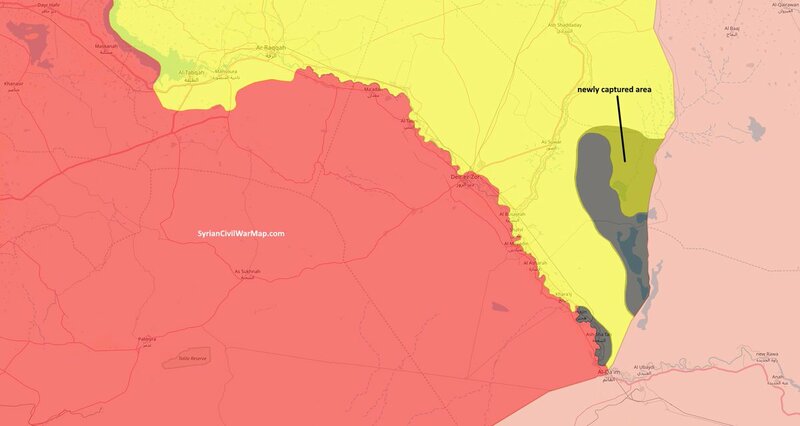 Syrian Democratic Forces captured Hadajah, Jabal Haddaj, Al-Mabaq, Al-Buwarah Shamliyah, Bir al-Rawdah, Al-Ajij, Fawq al-Tallabah, Al-Awaj, Hadd al-Janubi, Tallabah, Al-Barqah, Jabal Kabil, Al-Khaburah, and Al-Shahidin in eastern Deir al-Zour from the Islamic State. Syrian Arab Army entered the city of Al-Quneitra, as well as Al-Hamidiyah, Samadaniyah al-Gharbi, Al-Raadi, and Al-Qahtaniyah, as part of a reconciliation agreement with rebel factions. Syrian Arab Army and allies captured Sheikh Hussein, Kawkab, Al-Shabraq, Al-Musayritiyah, Wadi Saysun, Jallin, Al-Muzayra, Adwan Dam, Tell Ashtara, Tell al-Jumou, Sahem al-Jawlan, Hayt, Adwan from the Islamic State-affiliated Jaysh Khalid ibn al-Walid. 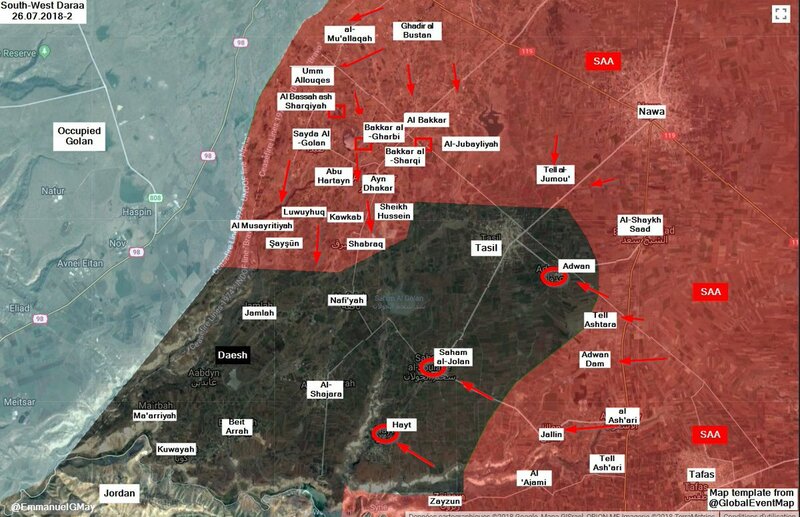 Reports also suggest that the Syrian Arab Army captured Tasil from Jaysh Khalid ibn al-Walid. 23 elements of the Islamic State and the group’s prominent commander, Mohammad Qasim surrendered to the Afghan National Security Forces in Derzab district. Afghan National Security Forces cleared the villages of Bidou, Sadr Abad, Ala Pygan, Urnaqah, Nuwarid, and Mallah in Dawlat Abad and Chahar Bolak districts from the Islamic Emirate of Afghanistan’s (Taliban) presence. Afghan National Security Forces arrested four elements of the Haqqani network in Sirkani district. 16 elements of the Afghan National Police surrendered to the Islamic Emirate of Afghanistan in Ahmad Khel district. Afghan National Security Forces destroyed a vehicle-borne improvised explosive device ands several weapons depots and ammunition caches in Ab Band district. Afghan National Security Forces found and defused 20 improvised explosive devices in Garmsir district.